If you spend much time in the wilderness, sooner or later your trusty steed and his sidekick are going to turn up missing. So what do you do? Someone once told me you will always find your lost horse in their last tracks. While that may be an over-simplification, it is a good place to start. The first thing I do when looking for a stray is to check the back trail for tracks. Chances are your stock is going to head for your starting point, but I caution you that doesn’t always hold true. So look around to determine which way they headed. Whether you are going after stock that may be headed 10, 20 or more miles back to your trailer or just around the bend to that big meadow, go prepared. Halters, leads, grain in a feedbag, food for yourself, rain coat, flashlight and vehicle keys. You never know what might happen. If you do have to walk out, I certainly hope you brought something besides cowboy boots. I have learned to stay off the trail to avoid covering any sign that I might want to check several times before committing to what could be quite a trip. Hopefully, you’ll be riding and not walking. I always keep at least one saddle horse securely tied on the highline at all time for just such emergencies. I also use Horse Bells. These are usually just a small cow bell on a strap that goes around the horse's neck. The sound of the bell lets me know that my hobbled or picketed stock are still nearby or, if they do decide to take off, where they are headed or hiding. Sometimes it is easier to track the horse bell than the horse. Many people leave the horse bells on all night just to know that their horses are still in camp and that all's well. 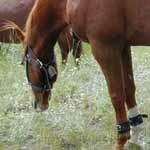 Stock not grazing or fenced should be tied to a horse highline or hitch rail.